As an organ recitalist and accompanist, Ian Hare has performed widely in Britain and abroad, including France, Germany, Holland, and the USA. He has played at many of the major London venues, notably Westminster Abbey, St Paul’s Cathedral, the Temple Church and an appearance at the BBC Proms. Performances in the past few years have also included engagements in Vienna and Berlin, and recitals at Queen’s College, Oxford and King’s College, Cambridge. 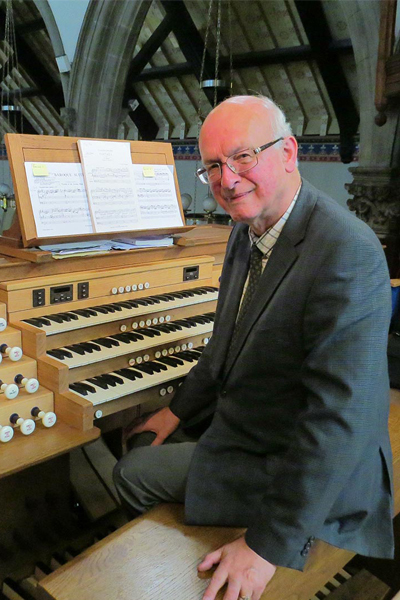 He has made several recordings, including broadcasts for radio and television, and organ CDs In Pastures Green (2002), Spirit of the North (2006) and Organs of the Lake District (2016). He is also a composer, specializing in choral and organ music, and has had a number of works performed and published in Britain and the USA. He has an extensive repertoire ranging from the 16th century to the present day, including a special interest in music by British composers. Currently, as well as directing Keswick Choral Society, Ian is the Director of Music at St Oswald’s Church, Grasmere, in the Lake District. He was previously at Crosthwaite Church, Keswick for 20 years. From 1981 to 1989 he was Organist and Master of the Choristers at Cartmel Priory and then Sub-Organist at Carlisle Cathedral until 1995. After founding the Lancaster Singers in 1975 he remained their Musical Director until 1989, conducting many choral works with orchestra and professional soloists. Ian was also Chorus Master of the Cumbria Rural Choirs for 25 years until 2016. Having begun his musical training at Hymers College, Hull and at St Mary’s Church, Beverley, he became a Fellow of the Royal College of Organists at the age of sixteen and studied in Paris with André Marchal. In 1968 he became the Organ Scholar of King’s College, Cambridge, under the direction of Sir David Willcocks. Following studies at the Royal College of Music and with Nadia Boulanger in France he was appointed Lecturer in Music at Lancaster University in 1974, subsequently becoming its first University Organist, and in 2006 he was awarded an Honorary Fellowship. In 2018 Ian retired as an Associated Board Examiner, in which role he carried out tours in the UK and the Far East; he remains in demand as a teacher.